Vivo Nex S went into the hands of Zack from the JerryRigEverything channel. Youtuber subjected the phone to standard torture, where the design, durability and performance of the device were tested. It turns out that the Vivo Nex S is a quite solidly made phone, where the producer probably did not try to save on materials. Vivo Nex S was presented in June and soon after that it was sold in China . Currently, the smartphone is going to new markets, and meanwhile also fell into the hands of Zack from the channel JerryRigEverything. He was tortured there. It must be admitted, however, that he abolished them well. The design of this model is solid. Vivo Nex S was first tested for scratches. The phone is on the sixth grade on the Mohs scale, which is typical for most models. 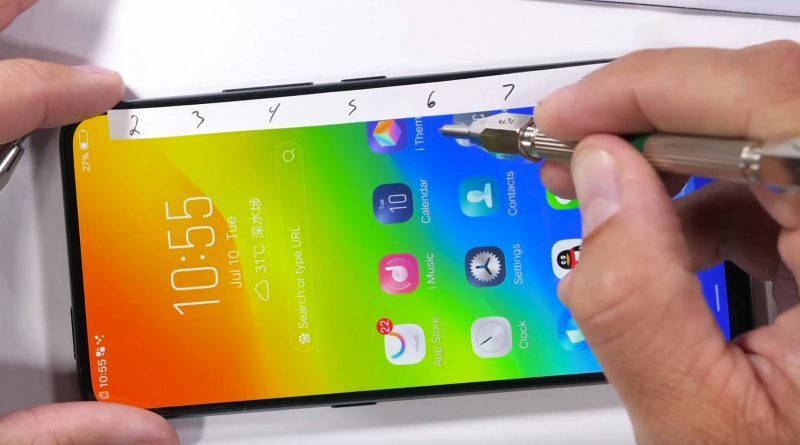 The fingerprint reader works without any problems on the screen. Even after some scratches. The same glass was covered with the rear panel. Not even saved on the LED illuminating LED, which is often covered with plastic. Vivo Nex S also has a metal frame. The buttons were made of the same material. So the producer did not save on materials. At the end it’s time to bend. Here the device has also handled it. Zack says the design is solid and this phone has passed its tests. We still have the Vivo Nex S front camera. As we know, this one is pulled out . For it you can set an additional sound (there are three to choose from). The mechanism itself works smoothly and pressing the camera causes it to hide, but after a while it slides out again. Using a stronger force will make it slip to the end. Check it out in the movie below. In China, Vivo Nex S is available from 4498 yuan (about 2500 zlotys). The device will now go to more markets . However, this does not apply to Poland. Who knows, maybe someday? Specifications of the Vivo Nex S can be found below. this design of the latest Vivo NEX ?